Not in the mood for a full-day tour? Then this excursion is for you! Enjoy a full of fun half-day snorkeling tour, sailing along the coastline you will appreciate the amazing view of Puerto Vallarta and the Sierra Madre while our staff takes really good care of you. This tour includes fresh-made food, premium open bar, snorkeling gear, scuba gear (12+y/o), paddle boards and kayaks. Meet your guide and crew at the marina and board the sightseeing cruise to start your tour. 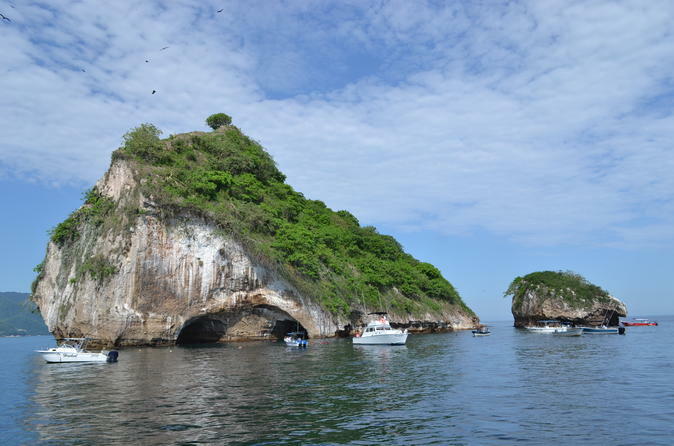 After a pleasant sightseeing ride along the shore of Nuevo and Puerto Vallarta, you will snorkel at Los Arcos National Park. We will provide snorkeling gear and water toys such as paddle boards, kayaks, and the scuba experience. After all the fun we will indulge you with our buffet lunch, that includes ceviche, guacamole, shrimp, crab and artichoke dips, and salads bar. During the cruise, and after the water activities, there will be an open bar for adults which includes beer, vodka, rum, whiskey, tequila, brandy, wine and even cocktails like a piña colada. Click the link below to check pricing & availability on your preferred travel date. Our pricing is constantly updated to ensure you always receive the lowest price possible.